Pilar Mendoza is a litigation attorney with extensive experience in all stages of civil litigation. She handles cases for both plaintiffs and defendants; and focuses on medical malpractice, products liability, tire defects, personal injury, class action suits, mass torts, probate and commercial litigation. Before joining McNamara Goldsmith P.C., Pilar worked for 8 years in the litigation department of a large firm representing plaintiffs in complex personal injury cases with multi-million dollar claim values. She enjoys developing a collaborative working relationship with her clients and handles both large and small injury cases effectively. Pilar is originally from Medellin, Colombia and is fluent in Spanish. 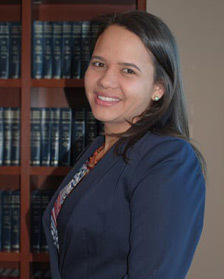 She has two law degrees; one from the University of Arizona (2006), and the other from Universidad Pontificia Bolivariana in Colombia (2000). Pilar is admitted to Practice in the State of Arizona and before the Arizona U.S. District Court. She is actively involved in the Arizona Trial Lawyers Association (AZTLA) where she currently serves as a Board member.